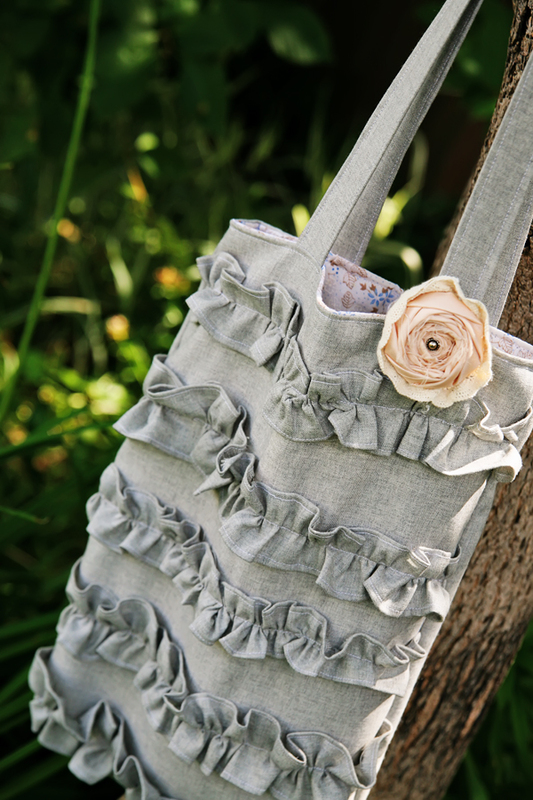 Ruffled Tote Tutorial – It Works For Bobbi! Published on August 4, 2011 August 9, 2016 by Bobbi-Jo G.
I found my fabric at a thrift store for $0.99! SCORE! I’ll have enough to actually make 2 bags, or ONE bag and one of something else. We’ll see 🙂 I chose the grey fabric for the outside of the bag, so I cut my 5 strips (for the ruffles) and the long strip (for the handles) out of the grey. 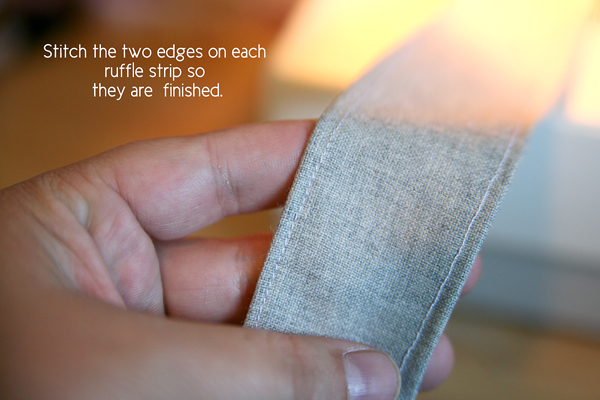 If you want your ruffles out of a contrasting fabric, just cut those 5 strips out of that. 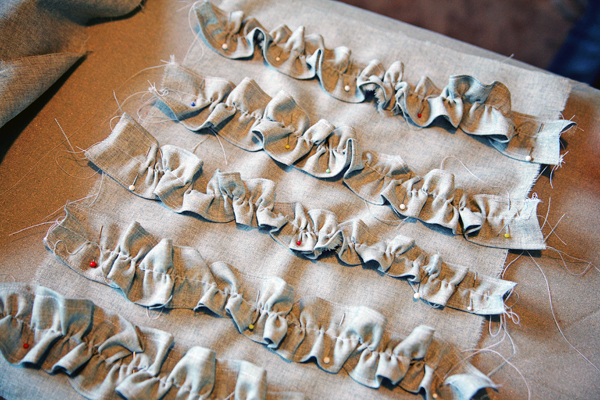 First we are going to work on the ruffles. 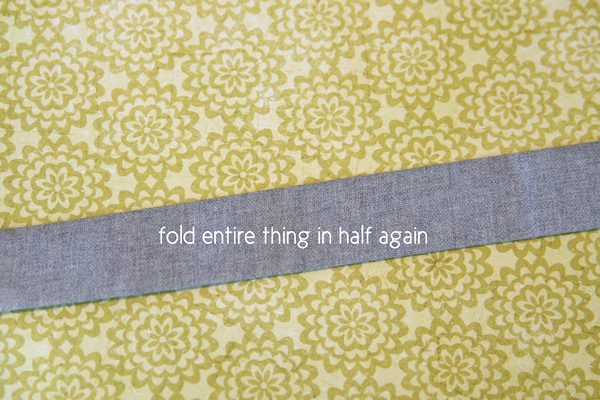 Take one of the 5 strips of fabric and fold in the edges about 1/4 of an inch. 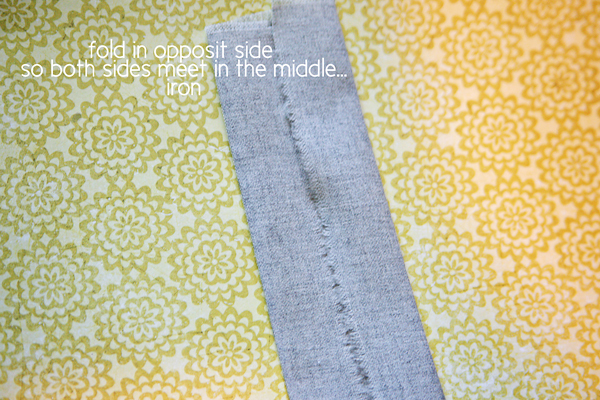 Iron flat, then straight stitch down the length to secure the fold. Repeat on the opposite side. This is just to make the ruffle edges more finished. 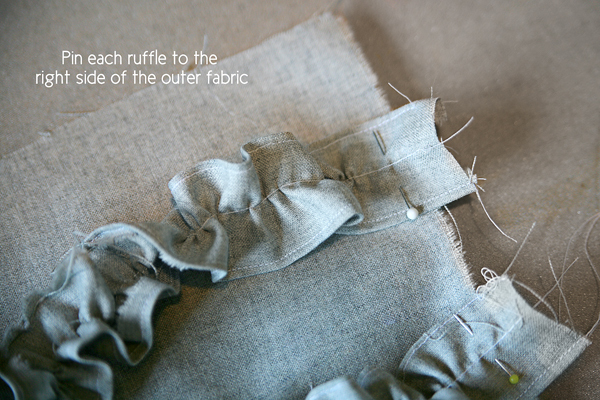 If you want your ruffles to be a little more “shabby” just skip this step and leave the raw edges on the strips of fabric. Now we are going to turn this flat, straight strip of fabric into a ruffle by changing your machine to the longest stitch it can do. 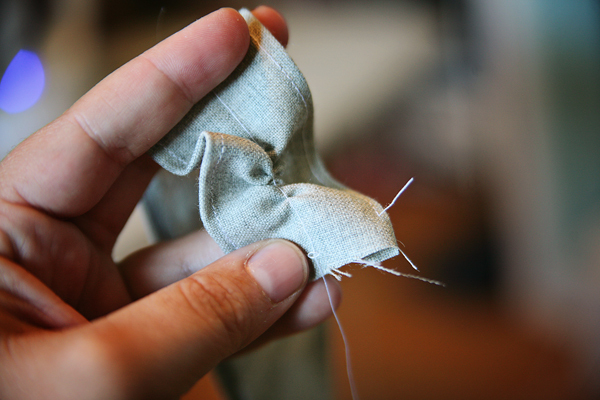 Then stitch straight down the middle of the strip of fabric. Do NOT backstitch! 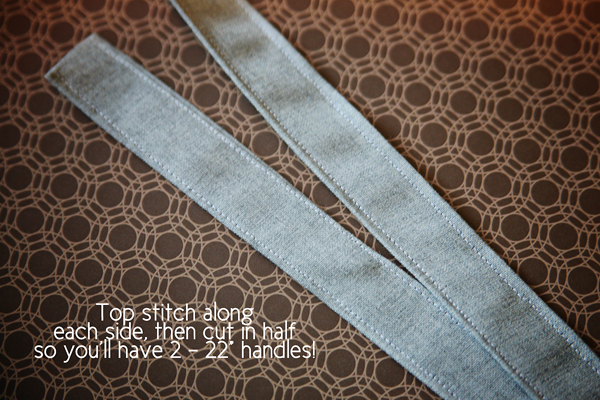 You will want to gather the full length of the strip, then pin one end to the edge of the RIGHT side of one of the outer bag pieces. 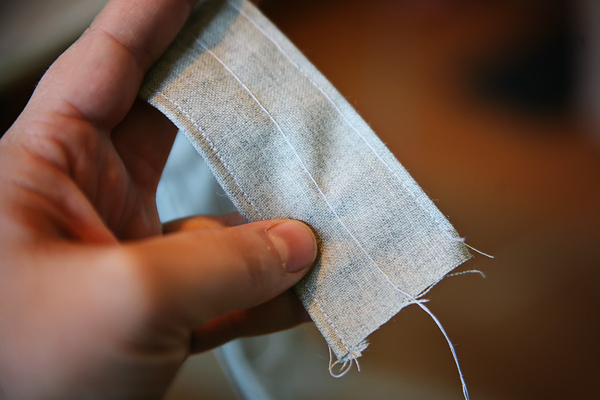 Adjust the gathered strip so it fits the width of the panel with the ends of the ruffle sticking out slightly on each end. Pin all along. Oh, and repeat with the other 4 strips. 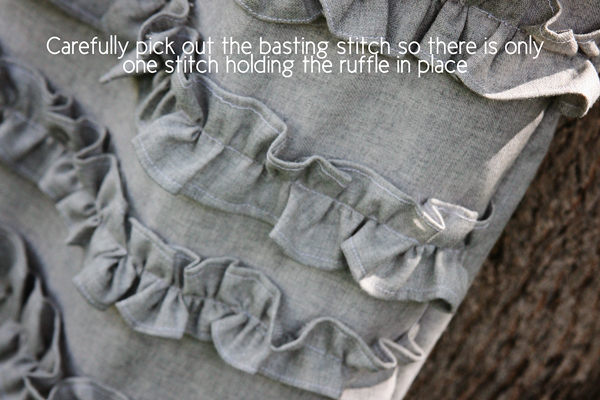 Leave about a 1/2″ to 1″ space in between each ruffle. 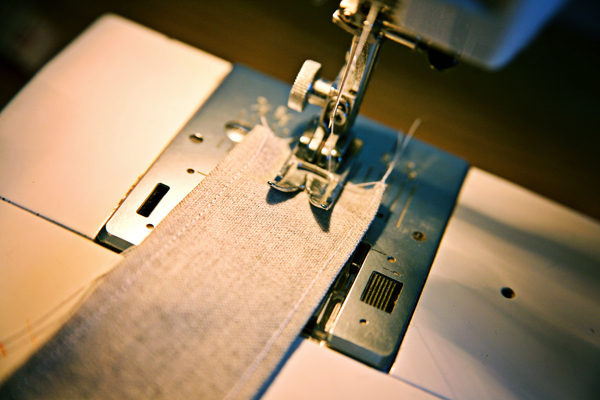 Switch your machine back to a regular stitch and stitch along each ruffle, stitching it right onto the fabric beneath it. Okay, the hardest part is done! 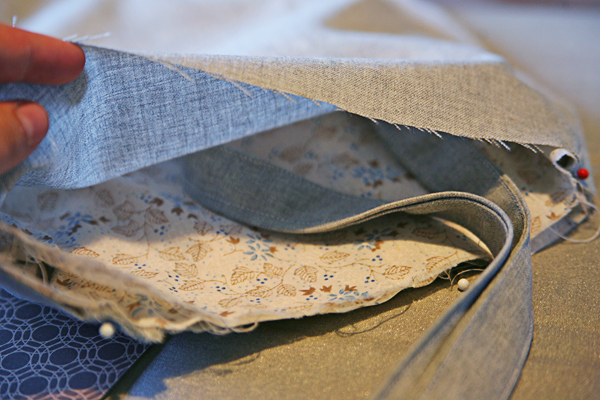 Now, take that ruffly piece of fabric and pin it to the matching fabric panel with RIGHT sides together. Pin the two long edges and the bottom. Repeat with the 2 lining pieces. Then stitch along the sides and bottom. Then stitch across. 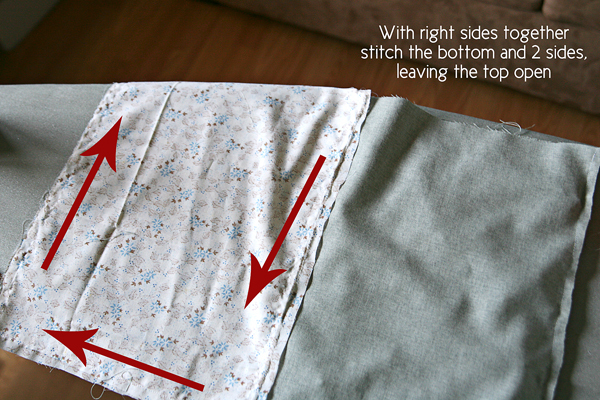 Repeat with the other corner of the lining, and the two corners of the outside bag piece. 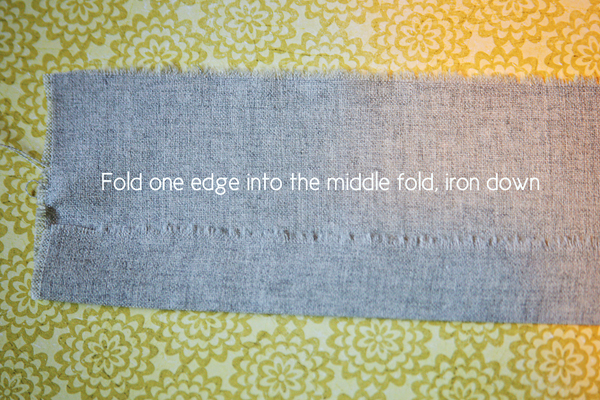 Fold one edge in to meet the crease in the middle. Iron down. Repeat with the opposite side so the two unfinished edges meet in the middle. 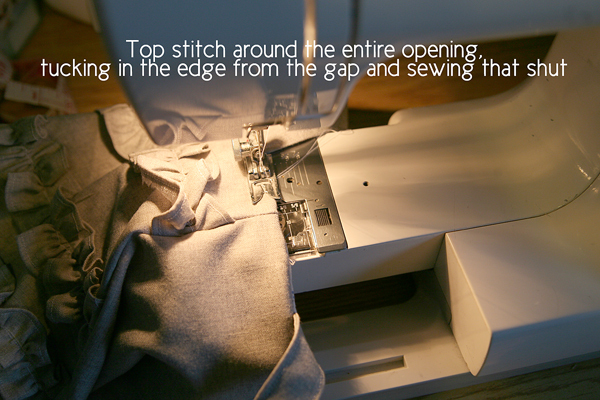 Top stitch along each edge down the entire length of the strip. When that is done, cut the strip in half to form two 22″ strips. These will be your handles! 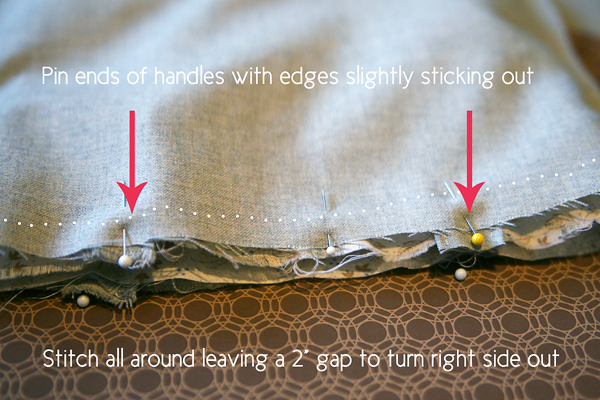 Then, take the two ends of that one handle piece and pin them about 2-3″ from each corner, with the edges slightly sticking out above the raw edges of the lining and outer pieces. Repeat on the other side of the bag with the other handle piece. 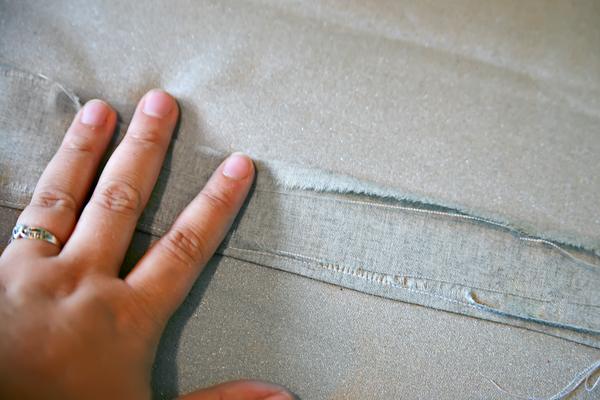 Make sure the handle isn’t slipped into the MIDDLE of the four layers of fabric, but is in between the outermost layer and the lining piece on each side. I hope this makes sense. 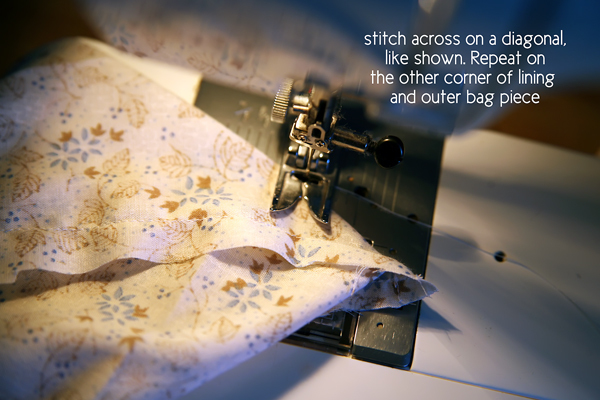 Now you will stitch along the edges- all around the bag – leaving about a 2″ gap so you can turn the bag right-side out again! 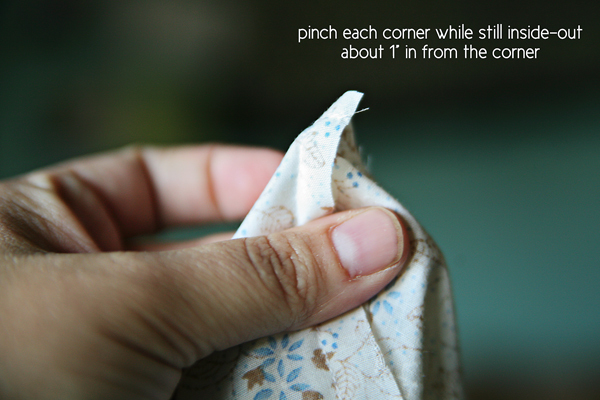 Stuff the lining into the bag and carefully fold the edges in the gap. 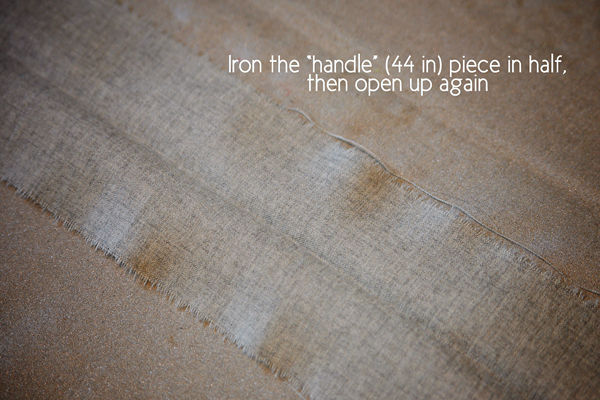 Iron the whole thing flat, then top stitch all around the top edge of the bag – stitching closed the gap while you are doing it. 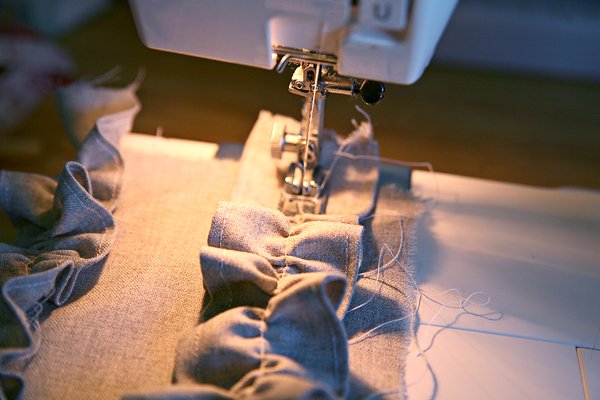 Lastly, carefully pick out the basting stitch out of the ruffles with a seam ripper so you only have one stitch holding them on to the bag. Voila! 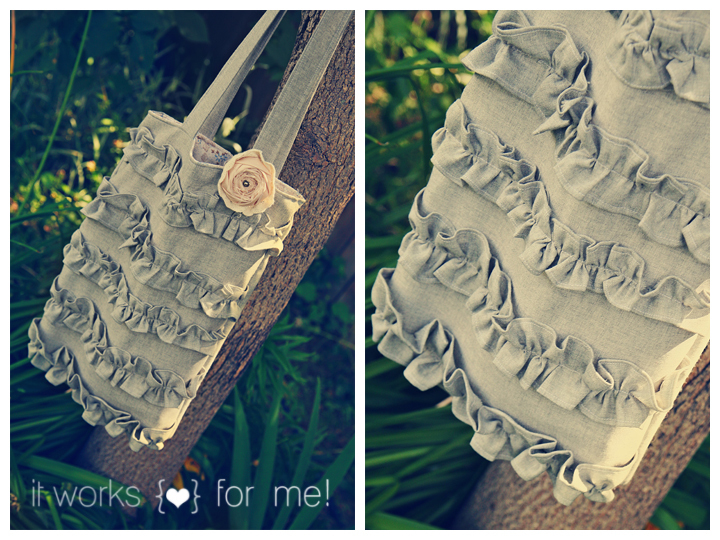 You are finished your cute ruffled bag! If you make one, I’d love for you to share a link so I can see it! 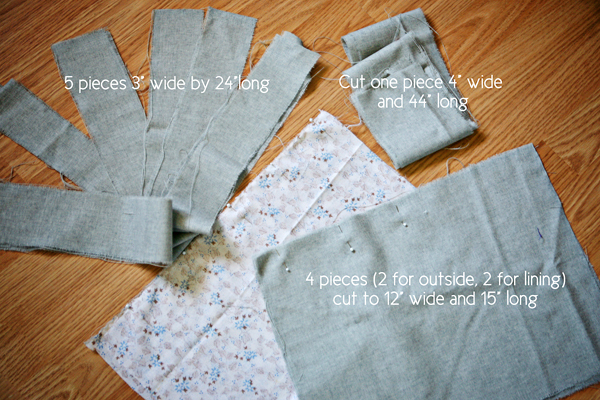 You can change the dimensions of the bag by simply changing the size you cut the four larger pieces of fabric, then making sure you adjust the length of the ruffle strips to match 🙂 Happy sewing! Next Free Friday! Laugh or Cry Printable! It's gorgeous Bobbi! I love it…can I just buy yours?????!!!! No…seriously! that is adorable. totally making one! 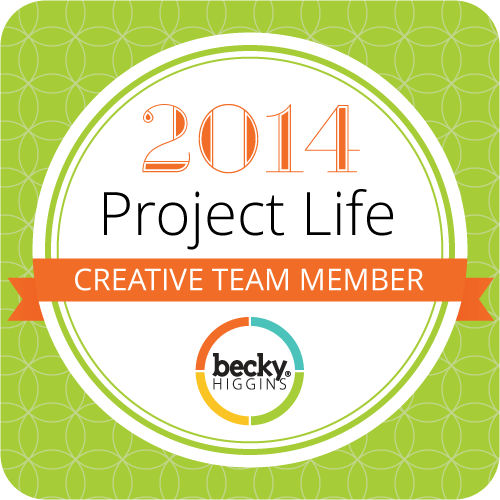 I love it, I really must make some time to copy some of your projects. Was linked to this by another blogger and I love it! I am definately going to make myself one! Thanks for sharing! Hi! I found this via Pinterest and made one last night. I made it for my niece who is turning one on Saturday, so I shrunk it down to a 9×7 with only three ruffles, and made the handles slightly thinner. I LOVE it. I almost don't want to give it up! I can't wait to give it to her this weekend. Thanks so much for the great tutorial! I loved the tutorial and made this for my daughter, I hope the link works for you to see it. Wow, that bag is AMAZING!!! I am definitely going to have to make one. I made mine using a jersey sheet from a thrift store (do not recommend this–way to stretchy!) and then double lined it in order to make it extra strong. I am student teaching so I have a lot of stuff to carry to school and back everyday. Here is the link for my Facebook photo of the exterior and interior visible lining. I dreamed about the lining fabric after I saw it for the first time and went back two weeks later to buy it. I am so in love!!! I just made this bag for a friend and it came out perfectly! I used a cute black and white pattern fabric. 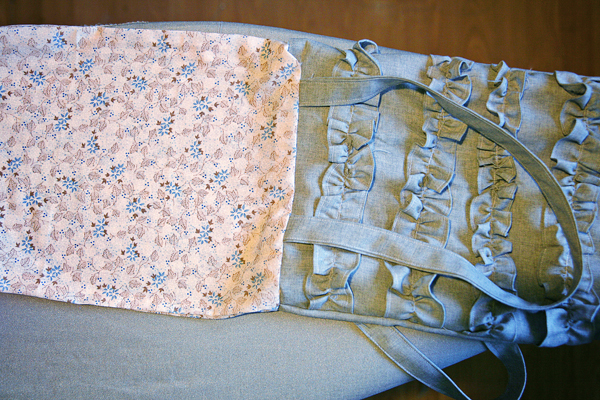 I also added interfacing to give the bag a bit more structure. Thank you for such a great tutorial! !